Cosmology is from Oxfordshire UK. He was introduced to what we now know as dnb at school age over 20 years ago. 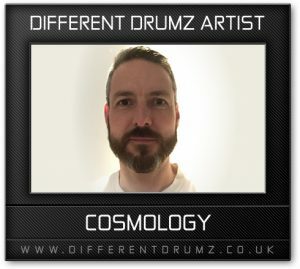 Having been passionate about the music for a number of years there came a point a more recently when he started thinking he’d like to have a go at making some of his own tunes so he picked up a midi keyboard which came bundled with cubase le in 2008 and started from there. In 2009 Plush recordings got in touch and asked if they could sign one of his tunes ‘Theres a saying’ after listening to it on myspace. Not long after that they commissioned an E.P. and tunes from that were picked up and supported by a number of DJs including Ashatak & Stunna. Following on from that he has had tunes signed to a number of labels including Phuzion Digital, Digital Blus, Soul Deep, Liquid Drops, Liquid Tones, DNBB, Binary Feedback, Storejam and a collab with Phat Playaz on Fokuz. In 2013 he was fortunate enough to have a vinyl release on Goodlooking alongside the very talented Enea owner of Beatalistics Records. He still sends his music to LTJ Bukem and he has supported a number of tunes since then. More recently Cosmology has had a two tracker on Blu Saphir which has done really well. One of the tunes has vocals from Ella Sopp, who he was fortunate enough to be able to work with. Tunes from the release have been supported by djs including LTJ Bukem, Nookie, EZ Rollers & Intelligent Manners. Presently Cosmology has just finished a collab with Kasper, (they got together after him hearing the tunes on the Blu Saphir release) which is due out on Celsius at the end of February. The track has so far been supported by djs including DJ Marky, Intelligent Manners, Stunna & Velocity on the HE podcast.